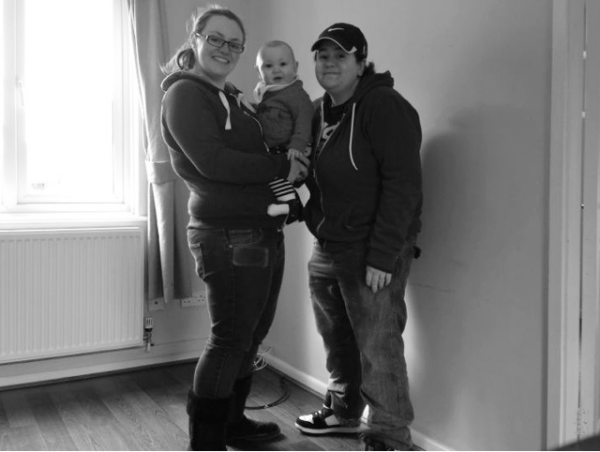 Each month we’ve enjoyed joining in with the fab linky “Me & Mine – A Family Portrait”. 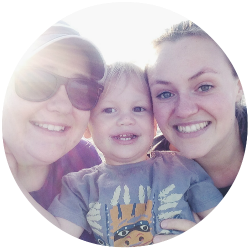 It’s a great linky run by 7 lovely ladies, it’s designed to encourage you to get your family in front of the camera for one fun family photo a month. I love taking pictures, so there’s always a good reason to take a picture. But I’m really awful at making sure I’m in some pictures to. Which is why this linky appealed to me, I can now look back each month and see a photo of my beautiful family. You can check out last months photo here. This months photo, to be honest is not that interesting. It’s a rushed photo, taken in a bady lit room using an app with a self timer function on C’s iPhone. But it’s a photo that will always mean so much to me as its the last family photo we ever took in the home we created our son in and eventually took him home to. The room we are standing in is the living room, just before we handed back the keys to our first official home in Dorset. It’s just an ordinary room, a bit small for a living room, a bit on the cold side and slightly mouldy. But it’s our first room we were able to take Monkey into, without midwives or nurses. Now we’re starting a new chapter, but I can’t wait until Monkey is old enough for me to tell him all about his first ever home. It’s one of the most special places on earth, as its where our miracle began. How wonderful! Your final photo in your old place….a big milestone. Thanks for posting this – I’m going to check out the linky. It’s a lovely photo of the three of you, and a great idea. Wow wow wow! Amazing that you managed such an important family picture before you moved! Made me feel so emotional. Move day is so hectic but I love that you found time to take this picture! Can’t wait to see next months picture in your new home!! It’s the memory behind the picture than it’s quality that is most important! We really should try and get more family photos! Oh my goodness this really made me tear up. I can completely understand why it is so special. This is such a poignant photo. I think there will always be a real emotional attachment to the place that you first bring your children home to, so many memories happen there. Good luck with the next chapter! That’s a lovely photo and a gorgeous story behind it too 🙂 hope your new home brings you just as much happiness. I think that’s one of the best photos I have seen for Me and Mine. A brilliant memory you will always remember!